10:28 p.m. - W. Market Street and Highland Avenue, Autumn Donegan, 22, of Girard, and Shain Picard, 30, both charged with possessing drug abuse instruments. Police pulled over a vehicle and said they found suspected drugs and several drug tools, including syringes. Both Donegan and Picard, who were in the vehicle, told police that they had no idea what any of that stuff was and said it wasn't theirs, according to a police report. More charges could be filed when police get the drug lab test results. 2:01 a.m. - South Street SE and Elm Road SE, Joseph Barrickman, 49, of Kinsman, charged with possession of drug paraphernalia; Joseph Smith, 47, of Kinsman, arrested on a warrant. Police pulled over a vehicle and reported that Smith threw a package of something in the back seat. When officers asked him what it was, he said it was his "medicine," according to a police report. Police said it was likely heroin. They also found suspected crack cocaine in Smith's pocket, according to the report. Police said there were also drugs on Barrickman's seat and drug tools throughout the vehicle floorboards. More charges could be filed when police get the drug lab test results. 10 p.m. - 700 block of Olive Ave. NE, John Deremer, Jr., 58, charged with obstructing official business. Police said Deremer, a passenger, was acting erratically and kept moving around during a traffic stop. Police said they found suspected crack on the passenger side of the car. More charges could be filed when police get the drug lab test results. 1:30 p.m. - 2400 block of Parkman Rd. NW, Miesha Collins, 31, of Youngstown, arrested and charged with theft. A man reported that a woman stole one of the pistols on his table at a gun show. Police found Collins and confronted her, asking if she had a gun. According to a police report, she said she didn't at first, but then admitted she did and handed over the pistol, which was under her jacket. Collins claimed she was not stealing it, but just carrying it around to compare prices, police said. 4:30 a.m. - 900 block of Glenwood St. NE, police said a woman overdosed while her 1-year-old son was in the home. When officers got there, they said she was breathing and awake, but incoherent. Police said they saw several drug tools, including crack pipes, a marijuana pipe and plastic straws, within the baby's reach. They said the home was in deplorable condition, with dirty dishes and garbage piled everywhere. Police said there was very little food in the house. A relative came to pick up the baby and police contacted Children Services to investigate. In the meantime, police said the woman ran from the ambulance and they weren't able to find her. 9:30 a.m. - 300 block of Southern Blvd. NW, reported theft of two catalytic converters from trucks at Disaster Recovery Services. 12:14 p.m. - 2600 block of Atlantic St. NE, reported theft from Christ Episcopal Church. Treasurers told police someone forged a check for $1,500 that resembled the checks the church uses. 2100 block of Colonial St. SE, Taejuan Williams, Brandon Reed and Dakarai Hudson, all arrested on warrants. Investigators found the men while searching a home suspected of drug activity. Inside the house, agents said they found suspected drugs, including crack cocaine and mushrooms, drug tools, guns and $4,100. The men's warrants were not related to the drug investigation. 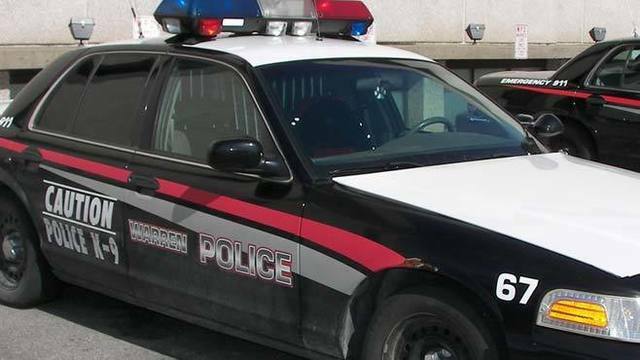 Disclaimer: These reports don't represent all calls made to the Warren City Police Department. This public information was provided in reports from the Warren City Police Department. Items reflect charges filed, not convictions.